I have one rule when it comes to Chip and Dan Heath books: if they write one, I read it. It’s a simple as that. Made to Stick is a must-read for anyone who teaches, writes, or speaks in any capacity. Decisive is good for anybody who ever needs to make a choice (I think that’s all of us). And Switch…oh, my. What does one say about Switch? Easily in the top five books I’ve ever read in any genre. Easily in the top three books I’ve ever given away by sheer volume. Easily a game-changer regardless of whether you’re reading it as a leader of people or even a follower of Jesus. There are so many good spiritual overtones in Switch I don’t even know where to start. So when I saw that the Heath brothers’ fourth book was releasing, I knew it needed to be in my read this now right NOW pile. 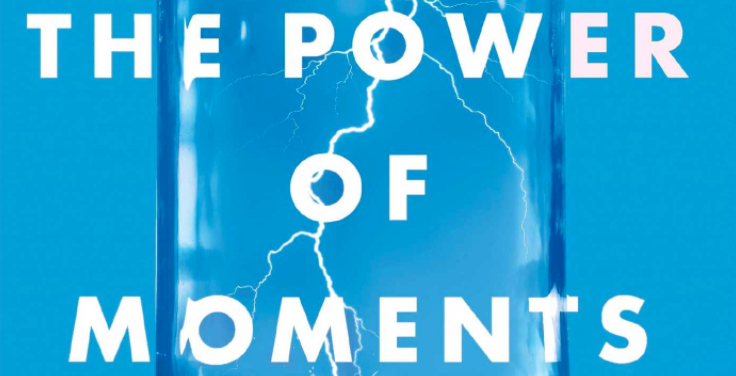 The Power of Moments: Why Certain Experiences Have Extraordinary Impact dropped last week. It is rich with non-boring research and fascinating stories on how the most memorable moments aren’t necessarily spontaneous and they can actually be engineered. Which is great news for those of us who speak, teach, train, welcome guests on the weekend, or plan events. Before I finished chapter one, I was already making plans on taking my direct reports through the book. By the end of chapter three, I made a mental note to buy a copy for all of our guest services staff. And by the time I wrapped up the entire thing, I had identified five different teams that I could expose to this work over the next few months. We must learn to think in moments, to spot the occasions that are worthy of investment…In organizations, we are consumed with goals…But for an individual human being, moments are the thing. Moments are what we remember and what we cherish. To maximize customer satisfaction…you don’t want to be perfect. You want to get two things wrong, have the customer bring those mistakes to your attention, and then hustle like mad to fix those problems. A relationship in which one party is oblivious to the most profound moments in the life of the other is no relationship at all. Familiarity and memorability are often at odds…If you’re looking to create memorable moments for your customers, you’ve got to break the script. Better to take a risk, try something, and distill the answer from experience rather than from navel-gazing. Action leads to insight more often than insight leads to action. Purpose trumps passion. Passion is individualistic. It can energize us but also isolate us, because my passion isn’t yours. By contrast, purpose is something people can share. It can knit groups together. We hate being treated impersonally: You are not special. You’re a number. Order The Power of Moments. I’m a big fan of the Heath’s work as well. I got a pre-release Chapter 1 of “the Power of Moments,” and it prompted me to pull a whole section of an upcoming training experience and rewrite it – 2 days before the event! As you stated, this will be a great training tool for Guest Experience teams.